Thu., Feb. 3, 2011, 10:18 a.m.
A historic brick building once used as a boarding school on the Coeur d’Alene Indian Reservation was destroyed by fire early today in DeSmet. The three-story building was a total loss, said Bob Sobotta, superintendent of the Coeur d’Alene Tribal School, which is adjacent to the fire scene. News files at The Spokesman-Review indicate that the building was constructed starting in 1908 and initially housed the girls school of the Sisters of Charity of Providence until 1974. It was known as the Mary Immaculate School. Sobotta said he was alerted to the fire about 3 a.m., and that firefighters from surrounding communities responded to the blaze. 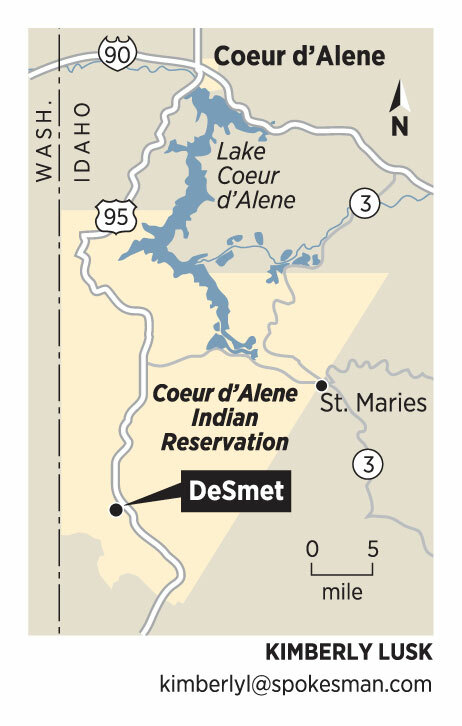 Sister Dolores Ellwart of the Sacred Heart Mission at DeSmet said the fire was under investigation by the Coeur d’Alene tribal police. She said the fire apparently started in a basement laundry room. The building had been used for storage by the Coeur d’Alene Tribe. Because of its height and location on a hill, the building also held telecommunications equipment. The Mission of the Sacred Heart was established initially on the St. Joe River and then moved to DeSmet in 1870s. In 1878, the sisters started their mission school after being invited to the reservation by Chief Saltese in an 1870 letter. Tribal chiefs also traveled to Vancouver, Wash., to ask for the school. Two earlier school buildings were destroyed by fire in 1881 and in the early 1900s. A tribal history gives 1905 as the date of the second fire. News files indicated that the second fire was in 1907. The boarding school building came to be known as the sisters school or sisters building. The mission school closed in 1974, in part because of a dwindling number of sisters. The school building later housed the tribal education department and a tribal cutting and sewing industry, Ellwart said. Today’s tribal school was established in place of the mission school, and the school building was turned over to tribal ownership. Authorities do not believe anyone was inside the building. The Tensed Fire Protection District and Plummer Gateway Fire Protection District responded to blaze, said Marc Stewart, tribe spokesman, in a press release. The mission is listed on the National Register of Historic Places. Published: Feb. 3, 2011, 10:18 a.m.